Valentine’s Day is quickly approaching. Think you know everything about the most romantic day of the year? Maybe not. There’s more to Valentine’s Day than flowers, heart-shaped boxes of chocolate, and a romantic meal with your special someone. In fact, Valentine’s Day goes back hundreds of years, and it’s celebrated in many different ways around the world. For instance, did you know that celebrating Valentine’s Day in some countries is a criminal offense punishable by jail time? Did you know that the phrase “wear your heart on your sleeve” came from an actual Valentine’s Day celebration? Find the answers to these questions and more by checking out the 14 fun facts below. And if you haven’t made Valentine’s Day plans yet, how does a night of romance complete with live music and fresh, handcrafted food sound? Pretty good, right? That's what Jag's will be serving up Friday (February 12th), Saturday (February 13th), and Sunday (February 14th). 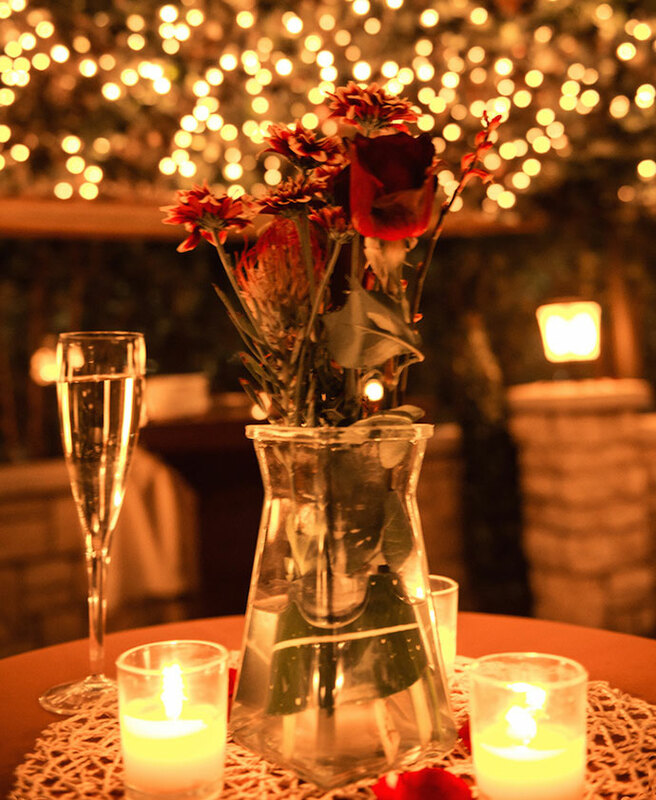 Make your reservation today, and let our professional staff help you celebrate that special someone. #1 - A note for the jailer’s daughter. There is no written documentation about how Valentine’s Day was created. However, there are some popular theories. One of the most widely accepted involves St. Valentine of Rome, who is believed to have lived during the third century. Under the Roman Empire, Christian preachings were strictly prohibited. Also banned - marriage. The Roman Empire was in desperate need of troops to continue its conquests, and the Empire found that men with wives and children were highly resistant to embark on a military expedition from which they may never return. Legend has it that St. Valentine conducted marriages without permission from the local authorities. He also reportedly preached Christianity in underground churches. Eventually, his activities were discovered and he was jailed for his offenses. #2 - Valentine’s Day is banned in Saudi Arabia. It turns out love isn’t the universal language. The holiday is banned in Saudi Arabia, along with several other Middle Eastern countries. Florists aren’t allowed to sell red roses when Valentine’s Day is approaching and many vendors don’t sell red garments for fear the products will be perceived as celebration of the holiday. Note: While celebrating Valentine’s Day can be punishable by jail time, some hotels, restaurants, and retailers have started to ignore the ban in recent years. #3 - Japan has two Valentine’s Days… kind of. In Japan, Valentine’s Day is celebrated a little differently than it is in the rest of the world. On February 14, the country celebrates Valentine’s Day, but this day is only for women to give gifts - traditionally chocolate - to men. A month later, on March 14, the country celebrates White Day, when men return the favor and give chocolate to the country’s women. Why the two holidays? You guessed it. The country’s chocolate industry realized it could sell more product if Valentine’s Day was stretched across two months. Thus, in 1978, White Day was born. #4 - Yes, your dog can be your Valentine. Not in a romantic relationship? Don’t worry. You can still celebrate Valentine’s Day. While Valentine’s Day is traditionally thought of as a romantic holiday, it’s really just an opportunity to express love for those who are important in your life. In fact, teachers get more Valentine’s Day cards than anyone. If you want to declare your dog or cat as your special someone, you’re not alone. Last year, Americans planned to spend more than $700 million on Valentine’s Day gifts for their pets. #5 - Thank you, Alexander Graham Bell. Mr. Bell probably never suspected his invention would be important in romantic relationships in the future. However, from teenagers talking to their boyfriend or girlfriend on the phone every night to today’s Millennials finding their next special someone on Tinder, the phone has played an integral role in relationships for more than 100 years. And as fate would have it, Valentine’s Day was an important date in the history of the telephone. Alexander Graham Bell filed the patent for his invention on February 14, 1876. #6 - The first heart-shaped box. In the 1800s, John Cadbury was one of the biggest chocolate producers in England. You may recognize his name from your favorite Easter chocolate treat - the Cadbury Egg. He and his family also have a connection to Valentine’s Day. In 1861, John’s sons, George and Richard sought to give the company sales a boost in between Christmas and Easter. Their idea? The heart-shaped box, a fun and memorable package that became a sensation in England at the time. #7 - Valentine’s Day all year round. Much like in nearby Japan, Valentine’s Day in South Korea is all about women giving gifts to their men. Then, in March, South Koreans celebrate White Day, in which men return the favor to women. South Korea doesn’t stop there, though. They also have a Black Day, in April, for single friends to give gifts to one another. In fact, South Korea has a gift-giving version of Valentine’s Day every month throughout the year. #8 - France banned Valentine’s Day celebrations. The French used to celebrate Valentine’s Day with a custom called “une loterie d’amour,” or “drawing for love.” During the celebration, men would walk down neighborhood streets shouting for women, who would then call out from their home’s windows. Eventually, the men and women would pair up. However, men could - and often would - ditch their original match if a more appealing option became available. Then, the women would start a bonfire in the street and hurl in pictures and remnants of old boyfriends, while cursing the men who had rejected them. As therapeutic as this may have been for the country’s women, French cities and villages began banning the tradition in the mid-1900s. #9 - Wear your heart on your sleeve. This popular saying comes from an actual Valentine’s Day tradition that started as an ancient Roman celebration. In ancient times, villagers would celebrate Juno, the Roman queen of gods and goddesses, by writing down all of the names of the area girls and putting the names into a bin or a hat. The village boys would then take turns drawing a name. The boy would then wear the name pinned to their sleeve for the next week, in the hopes that the girl would take notice. Variations of the celebration continued throughout Europe for centuries as a way to celebrate Valentine’s Day. #10 - A poem for an imprisoned man’s wife. Jail plays a central role in the history of Valentine’s Day. Perhaps time away does make the heart grow fonder? The first recorded Valentine was sent by the Duke of New Orleans to his wife. He was imprisoned in the Tower of London and communicated with his wife by sending her a love poem on Valentine’s Day of 1415. #11 - No Hallmark holiday. The next time you hear someone complain that Valentine’s Day is a made-up “Hallmark holiday,” tell them they don’t know what they’re talking about. Hallmark printed its first Valentine’s Day card in 1913. The first Valentine’s Day celebration on record happened in 1537. #12 - China has the anti-Valentine’s Day - Singles Day. Perhaps out of necessity, China not only celebrates Valentine’s Day, but also has Singles Day on November 11. Started in the 1990s, Singles Day is thought to have been created out of frustration with the gender imbalance in the country, where the male population significantly exceeds the female population. And Singles Day is big business, rivaling Black Friday in the United States. Single Chinese men often use the day as an opportunity to splurge on televisions, cars, or whatever gift they’ve been wanting to give to themselves. #13 - Valentines Day is a popular birthday. You can’t choose your own birthday, but given advancements in c-sections and birth inductions, mothers are now often able to schedule the delivery of their children within a specific time range. And given the opportunity, many mothers may be choosing Valentine’s Day for their child’s birth. A recent study of U.S. birth certificates found that there are four percent more births on Valentine’s Day than on surrounding days on the calendar. And curiously, there are five percent fewer births on Halloween than on other days in October and November. #14 - You can send your valentine a valentine from Valentine. Want to make your Valentine’s Day card extra special this year? Get it into the Valentine, Nebraska post office before February 6. They’ll then forward the card onto your loved one with a special, commemorative postmark from Valentine, Nebraska. And of course, after your special someone receives their Valentine Card and gift, the best way to make the night memorable is to head to dinner at Jag’s Steak and Seafood. We’ll help you celebrate with a custom Valentine’s Day menu featuring some of our most romantic dishes. (Menu coming soon). Make your reservation today.